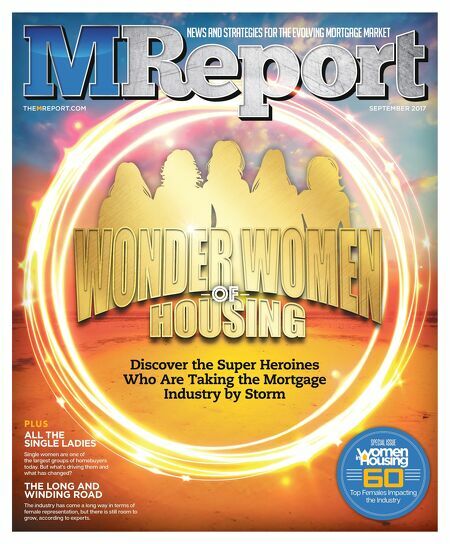 news and strategies for the evolving mortgage market SEPTEMBER 2017 THEMREPORT.COM Discover the Super Heroines Who Are Taking the Mortgage Industry by Storm SPECIAL ISSUE 60 Top Females Impacting the Industry –OF– PLUS ALL THE SINGLE LADIES Single women are one of the largest groups of homebuyers today. But what's driving them and what has changed? THE LONG AND WINDING ROAD The industry has come a long way in terms of female representation, but there is still room to grow, according to experts.